Your resume gives a clear picture of you as a person to prospective employers. A well-written resume can help you create a good impression during interviews. The hobbies that you have, help in giving a clear picture about your likes and dislikes to the interviewer. It also helps them relate your hobbies to the skills associated with the profile they have an opening in. 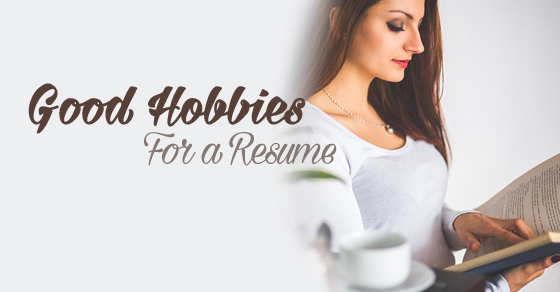 Though you may have multiple hobbies, yet your choice of a career will help you decide what hobbies to mention in resume. Therefore, you need to be very specific about your major hobbies that you mention in your resume. Reading surely is one of the best hobbies to list out on your resume. You always gain respect when you are a well read person. Reading as a hobby shows that you have a high level of imagination. It also reveals your keen interest for gaining knowledge and knowing what is happening in the world around. People with good reading skills are known to be good communicators. This could be another reason why reading is a great hobby to add to your resume. Mention some of the latest, relevant books that you have read to the interviewer. The greater the diverse range of books you read, the better will be your image. You may mention an assortment of novels, magazines, self-help books and spiritual books as these all add to your perspective and a better outlook. It is true that you can never really market or exhibit your undying quest for knowledge. Yet, in the modern world, where everything depends on how you market yourself, listing out your interest in libraries and museums may help significantly. An interest in learning related hobbies can show that you have a quest for knowledge, a skill which most companies look for in good researchers, especially in positions that require a lot of research work. There are many jobs that seek intense research skills in their employees. You could be a sure choice in such firms if you have an inclination for gaining knowledge from different sources. In the modern world, the use of different good websites of prominence can also be stated as an equally important skill. It may even reveal your true research abilities befitting the modern world needs. Participation in group sports such as basketball, football, cricket etc. signifies that you have the ability to work as a member of a team to achieve a common goal. This is a quality that companies across different industries look for, and is ideal for job profiles where you will need to work in team based environments. If you are good at coordinating with people and working with a team, it sure counts as a great ability. No one can succeed as an individual. Most companies that prosper have great teams that together work towards a single goal and succeed. While interviewers may not ask you directly whether you are a team player, they may try to find answers to such questions by reviewing your hobbies. So make sure, you list out hobbies that reveal your true team spirit. There are many jobs that require the employee to travel places and meet people. Many people are hesitant to travel to new places because they lack the health or the willingness. Thus, if you have an inclination for travelling and being places, make sure you list it out on your resume. A traveller should have some knowledge of geography, diverse cuisines, different cultures and the varied time zones. It will help him be mentally prepared for the travel experience. Most employers find it difficult to find such candidates. Another reason why listing out your inclination for travelling can help greatly. It gives your employer a clear picture that you are not hesitant about venturing out into the world to experience things which are not known to you. Make it a point to mention the most recent destination you have visited. Hobbies like painting, cooking and photography are usually preferred by people with an artistic bend of mind. Your interest in these pursuits will signify that you are a creative person to the employer. Such hobbies are highly valued by employers based in industries such as PR, graphic design, advertising, fashion etc. If you are in advertising, you need to be creative. You should be in a position to come up with good ideas. Everyone who likes a profession may not possess the skills required for the same. Recruiters thus scan the resume for any hobby that reveals the artistic side to the recruiter. Participation in sports such as cycling, running and swimming will signify you as a person having perseverance, tenacity and the enthusiasm that companies usually look for in a candidate, especially for profiles in sales and business development which require a lot of energy and persuasive skills. These are fields where you need that extra edge in you to be really successful. Perseverance cannot be tested in a round of interview. It is the same with persuasive skills and endurance. Your hobbies and interests may, however, give a hint to the interviewer whether you really have it in you or not. So do not hesitate or think twice before listing out the whole list of sports and outdoor activities where you have been the champ. The modern day office work greatly relies on how an individual’s mind performs. A poor thinker cannot succeed in the modern business world. This is the world where brain power matters much more than physical strength. An interest in games such as Sudoku and chess shows that you have the ability to think strategically. This type of strength is best suited for roles in policy development and strategy formulation type jobs. Some recruiters have IQ tests and certain quizzes to measure your intellectual capability. There are others who try to identify your intelligence by your game choices and modes of entertainment. So do not hesitate to list out in your resume if you love solving the Rubix cube or are an expert at the jigsaw puzzles. Your interest in creative writing, in the form of blogs, short stories and poetry can help to highlight your proficiency as a writer or editor. This skill is highly valued in professions such as journalism and public relations where good writing skills are one of the major skills that prospective employers look for in candidates. The modern world is losing the essence of writing because of haste and busy schedules. That is why there are few writers who can express exactly what they feel. If you are one of them, do not hesitate to reveal your skills to the world. As you go higher up the success ladder, risk taking becomes an essential attribute. If you fail to take the necessary risk, you may never succeed in your career. Your participation in activities like skydiving, mountain bike racing and mountain climbing will signify that you are happy to take risks and are gifted with a spirit of adventure. These strengths are suitable for candidates who are going to apply for managerial positions or for roles in team leadership. Your liking for such sports reveals you are fearless and strong. This will definitely help to add an edge to your resume. Such hobbies signify that you are someone who has the ability to work as a part of a team. This would make you a suitable candidate for managerial positions in the specific industry you are interested in. It does not mean that you can just work satisfactorily in a team but also shows that you can contribute positively to the growth and development of the team and help it progress. Apart from enhancing your public speaking and communication skills, acting can be a desirable hobby that you can mention in your resume. While acting, your focus is on people, situations and feelings. If you have been involved in theatre then it will help you to work on your body language. The way you carry yourself to a great extent determines people’s perception about your approach to work. In many professional situations, you may have to control your emotions and speak in favour of company decisions. Your face and body language should not reveal your true emotions to the onlooker. This can happen if you are a good actor and know how to control your true emotions. There are countless hobbies but how you use it to benefit your career and growth is completely upto you. Only a smart candidate knows to make the best use of his skills, abilities and choices to succeed in his career.